Even as the second half of the season gets underway, the AAF continues to surprise. From one week to the next, you're never quite sure what you're going to get in this league. For example: Just when you think the Orlando Apollos are invincible, they get shocked at home by a team on a three-game losing streak. And just when you think Johnny Manziel's pro football career might be over, he re-emerges. And right when you believe Luis Perez will never start at quarterback in another game again, he plays his most exciting game of the season. No, you never quite know what you're going to see in the AAF. So let's break everything down in this week's takeaways. The question has finally been answered. If you cut Orlando, sure enough, it bled real blood. (And, until Saturday, nobody made Orlando bleed its own blood. Nobody.) The Apollos' 22-17 loss at home to Arizona was a reminder that no team is perfect. Orlando played its worst game of the year, scoring a season-low 17 points. Outside of its first drive of the game, a 12-play scoring effort, it rarely found any sustained success. One example of success the Apollos did find would be the 98-yard scoring drive -- with the help of some penalties on Arizona, mind you -- in the fourth quarter to pull ahead 17-14. The 2:09 possession still showed how dangerous the Apollos could be in scoring from literally any spot on the field. It's impossible to keep this team down for all 60 minutes. But, goodness, the Hotshots did their best. Quarterback Garrett Gilbert threw his first pick of the season and nearly tossed a few more. He was sacked twice, losing what would be a game-altering fumble, pressured seven times and never looked fully comfortable in the pocket. Then on the back end, the Hotshots did a nice job of keeping leading receiver Charles Johnson under wraps with just 28 yards on four catches. Orlando looked out of sorts for most of the night, and while plenty of credit goes to Arizona, sometimes you're just off your game. In a text message, Hotshots general manager Phil Savage put his team's stunning win over Orlando succinctly: "We needed that one." Boy, did they ever. Arizona was on a three-game slide heading into Saturday's road game and besting the AAF's premier team in their house is a heck of a way to get going in the right direction again. Remember: the Hotshots were nearly a double-digit dog. So what went right? As mentioned above, the defense played lights-out for all but about two or three drives, holding the Apollos to five yards per play. The offense went toe-to-toe with the Apollos, running the ball effectively with Tim Cook (11 carries, 71 yards), Jhurell Pressley (13 carries, 57 yards) and Justin Stockton (12 carries, 37 yards). Cook and Pressley both had runs of at least 20 yards, too, so chunk plays came up big. That three-headed monster in the backfield gave Arizona's offense fresh legs while wearing down the Apollos' defensive front. The Hotshots didn't play keep-away, they just had more success controlling the line of scrimmage. The end result was greater efficiency when it mattered: in the red zone. Arizona was 2-of-2 in red zone scoring situations, including 1-of-1 in goal-to-go situations. Meanwhile, receiver Rashad Ross turned in arguably his gutsiest performance of the season even though it marked his first game without a touchdown. Battling what appeared to be lingering injuries to his torso area, Ross still found himself open down the field and battled through tough hits over the middle to catch five passes for 51 yards. About the only area in which Arizona struggled was penalties. The Hotshots were flagged 12 times for 142 yards, though some shaky pass interference calls played a role in that. In any case, this was the type of game it needed to have, when it needed to have it. Memphis may have lost quarterback Zach Mettenberger to an ankle injury, but it gained a stud wideout in Reece Horn. The 6-foot-3 pass catcher established himself as a big-time deep threat in a 22-9 loss to the Stallions, catching a team-best eight passes for 129 yards. He did most of his damage in the first half, getting 99 of those yards on six grabs, but his key fourth-and-20 reception over the middle gave the Express life late in the game. It was far and away Horn's best game of the season. His previous single game high was six catches for 56 yards in a Week 2 loss to Arizona. Horn was practically impossible to cover in Week 6. He found holes in the zone all day and came up with clutch catch after clutch catch. With Johnny Manziel now in the fold at quarterback, Memphis' offense may have found a spark. Coming into Sunday's matchup against Atlanta, the San Antonio Commanders had one of the worst passing defenses in the Alliance. Meanwhile the Legends were on to something with quarterback Aaron Murray, who was averaging more than 300 yards of total offense per game. Then, it all went kaput. Murray was picked three times, including this pick-six thrown to safety Derron Smith, and it was all Commanders, 37-6. It was Smith's third interception in the past two games and his second straight game with a pick-six. Smith is quickly emerging as one of the top defensive backs in the AAF. But that was simply a poor decision and throw by Murray. Yes, the Legends were playing from behind, but the offense took a major step back. Atlanta ran nearly 20 more plays than San Antonio (67 to 48) but totaled only 290 yards at 4.33 yards per play. That's more like the Atlanta team we saw in the first three weeks of the season before Murray came in for Matt Simms against Arizona. 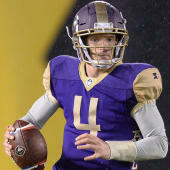 And now, against the top two teams in the AAF, Atlanta has been thoroughly outclassed. It'll be interesting to see if Manziel can have an instant impact for Memphis when he arrives this week. It's certainly fair to have reservations, but if he proves to be an upgrade at quarterback, it'll be Atlanta looking up at the East playoff race from the bottom of the standings. To call Perez uneven in the Birmingham Iron's 32-29 win over the San Diego Fleet would be a disservice to the physics of balance. On one hand: yes, Perez was clearly a different, more confident quarterback coming off the bench for Keith Price, who left the game early with an undisclosed injury. Perez threw for 359 yards and three touchdowns, looking little less like the dink-and-dunk quarterback of previous weeks. And who knows? Maybe getting benched somehow lit a new fire under Perez's backside. Maybe he watched more YouTube videos. Jokes aside, he was more willing to push the ball downfield and tossed some beautiful dimes to L'Damian Washington. But sometimes Perez was a bit too confident to the point where it affected his decision-making. That's been a persistent issue all season. Perez's two interceptions were nothing more than the unwillingness to swallow a bad play down and live to fight another play. His first pick was a classic mistake: rolling out to one side of the field and then throwing the ball back across his body into coverage. The second was even worse. Instead of taking a sack, Perez threw a wounded duck right into the arms of Demetrius Wright. Perez also came close to throwing another one or two interceptions as well. His protection wasn't great -- and hasn't been for most of the year -- but that's no excuse for trying to do too much. Some of those decisions could have cost Birmingham more than they did. But they're also the types of needless choices that tick your defense off to no end by putting them in bad situations. It's worrisome that in Week 7 he's still making those decisions. Still, it's undeniable that without Perez's deep ball completions, the Iron may not have won. The quarterback situation will be interesting for this team moving forward if both players are healthy. Price was clearly a needed change from Perez in Week 5, but Perez got the job done in Week 6 coming off the bench -- even if the job was harder than it needed to be at times. Birmingham Iron wide receiver L'Damian Washington: The Iron have had different receivers step up in different games throughout the season, but Washington may have had the best individual performance by an Iron pass-catcher to date. That's a big deal, too, considering how ineffective Birmingham was in that department early in the season. Washington finished the game with four catches for 128 yards -- including a season-long 83-yard catch and run -- and a pair of touchdowns.